PITTSBURGH (AP) — Xavier Johnson glanced down at the box score and shrugged. Sure, the Pittsburgh freshman understands the numbers he put up during an 84-75 victory over Troy on Monday night — when he scored 15 points to go with nine assists and seven rebounds — looked impressive for someone playing his third collegiate game. It’s just that it was no big deal to the athletic 6-foot-3 point guard who is off to a precocious start for the rebuilding Panthers. And playing it with an urgency that has Pitt off to a solid start under first-year head coach Jeff Capel. Johnson used his quickness to get in the lane and set up his teammates, took a charge on defense and even knocked down a couple of 3-pointers as the Panthers improved to 3-0. Capel is spending his first weeks on the job trying to get a feel for a group that has a mixture of holdovers from a team that went winless in the Atlantic Coast Conference last season and a handful of freshmen that are part of his long-term plans to turn the program around. Johnson is a key part of the process. His athleticism gives the Panthers a dimension they’ve missed in the backcourt in recent years and he has quickly embraced the up-tempo style Capel is trying to implement. Jared Wilson-Frame scored 24 points off the bench for Pitt. Kene Chukwuka added a career-high 13 points for the Panthers and Terrell Brown chipped in 12 as Pitt took a quick lead and spent most of the night fending off a series of mini-runs by the Trojans (1-2). Capel suspended Wilson-Frame for last week’s season opener for a violation of team rules. The Panthers played so capably without Wilson-Frame — the program’s leading scorer last season — that Capel opted to keep Wilson-Frame out of the starting lineup upon his return, hoping the versatile senior guard could provide some scoring punch off the bench. Wilson-Frame has responded brilliantly. He scored a team-high 20 points in a victory over Virginia Military Institute last Friday and backed it up by knocking down 9 of 15 shots — including 6 of 10 3-pointers — as the Panthers held on. “I think that he trusts that he’s open and if we do things the right way, the ball will get to him,” Capel said of Wilson-Frame. Jordon Varnado led Troy with 22 points and Alex Hicks added 16 and Troy hung around despite never leading and shooting just 35 percent (22 of 63) from the floor. The Trojans have lost two straight, both by single digits on the road against teams from conferences that carry a higher profile than the Sun Belt. Despite the result, Cunningham is impressed with the way his group handled itself. Troy just couldn’t make a big shot when it needed one. The Trojans finished made just 6 of 21 3-pointers. That wasn’t an issue for the Panthers. Wilson-Frame knocked down 3-pointers on three consecutive trips midway through the second half as Pitt built a 14-point lead and nursed it the rest of the way. Troy: The Trojans, picked to finish fourth in the Sun Belt Conference, will be a handful for league opponents. Troy blocked five shots and refused to bail in the second half after Wilson-Frame got hot. 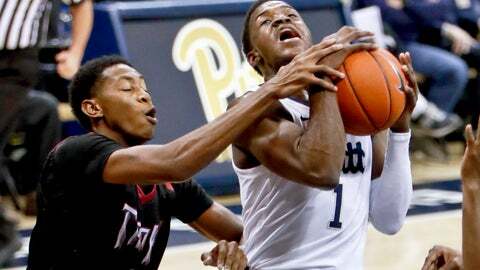 Pitt: Rebounding is going to be an issue all season for the undersized Panthers. Troy was able to hang around for so long despite its shooting issues by crashing the offensive glass. Both teams finished with 37 rebounds but the Trojans had 14 offensive boards, which translated to a 16-5 advantage in second-chance points. Troy: host Southern Miss on Thursday. Pitt: Welcomes Central Arkansas on Thursday.